Created to your specified diamond quality, this elegant flower styled diamond halo ring is set with 3 different sized diamonds in a unique design. The Fleur ring design achieves dramatic results—combining 3 separate Diamond sizes in one dramatically styled halo ring design. 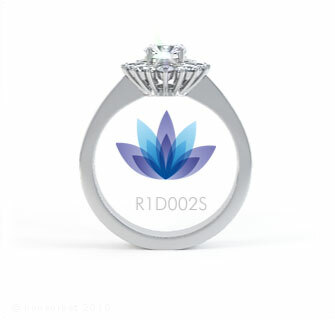 Your feature Diamond can be chosen from the menu section of our page—available in different colour and clarity options. We craft a unique ring based on your chosen specifications in a choice of 18ct White Gold or Platinum. In addition to your centre Diamond chosen, we meticulously set 0.30cts of matching Round Brilliant cut Diamonds into the surrounding halo. This exquisite Diamond Engagement Ring design features mirror polished scalloped settings above an intricate wire basket design. The 2.5mm wide band benefits from a comfortable court profile. Please allow 5-6 weeks for completion of your commission. We offer Worldwide delivery from the UK with fully insured shipping and both tax and duty included before purchase.